What happens when a father, alarmed by his 13-year-old daughter's nightly workload, tries to do her homework for a week. That is the advice of my 13-year-old daughter, Esmee, as I struggle to make sense of a paragraph of notes for an upcoming Earth Science test on minerals. “Minerals have crystal systems which are defined by the # of axis and the length of the axis that intersect the crystal faces.” That’s how the notes start, and they only get murkier after that. When I ask Esmee what this actually means, she gives me her homework credo. Esmee is in the eighth grade at the NYC Lab Middle School for Collaborative Studies, a selective public school in the Chelsea neighborhood of Manhattan. My wife and I have noticed since she started there in February of last year that she has a lot of homework. We moved from Pacific Palisades, California, where Esmee also had a great deal of homework at Paul Revere Charter Middle School in Brentwood. I have found, at both schools, that whenever I bring up the homework issue with teachers or administrators, their response is that they are required by the state to cover a certain amount of material. There are standardized tests, and everyone—students, teachers, schools—is being evaluated on those tests. I’m not interested in the debates over teaching to the test or No Child Left Behind. What I am interested in is what my daughter is doing during those nightly hours between 8 o’clock and midnight, when she finally gets to bed. During the school week, she averages 3 - 4 hours of homework a night and 6 1/2 a half hours of sleep. The Homework Wars: How Much is Too Much? Read more. Some evenings, when we force her to go to bed, she will pretend to go to sleep and then get back up and continue to do homework for another hour. The following mornings are awful, my daughter teary-eyed and exhausted but still trudging to school. I wonder: What is the exact nature of the work that is turning her into a sleep-deprived teen zombie so many mornings? I decide to do my daughter’s homework for one typical week. By late afternoon, I am tired after filing a magazine article on deadline. I’m not looking forward to homework. When I arrive home, a few minutes ahead of Esmee, I consider delaying my week of homework, but then I realize that Esmee can never put off her week of homework. So I am relieved when she tells me she doesn’t have much tonight. We have 11 algebra equations. (Esmee’s algebra class is doing a section on polynomials, a word I haven’t heard in decades.) We also have to read 79 pages of Angela’s Ashes and find “three important and powerful quotes from the section with 1–2 sentence analyses of its [sic] significance.” There is also the Earth Science test tomorrow on minerals. I am surprised by the amount of reading. Reading and writing is what I do for a living, but in my middle age, I’ve slowed down. So a good day of reading for me, assuming I like the book and I’m not looking for quotable passages, is between 50 and 100 pages. Seventy-nine pages while scanning for usable material—for an essay or for homework—seems like at least two hours of reading. I then start reading Angela’s Ashes while Esmee studies for Earth Science. We have only one copy of the book, so we decide it will be more efficient to stagger our work. I’ve never read Angela’s Ashes, and it’s easy to see the appeal. Frank McCourt, whom I once saw give a beautiful tribute to Peter Matthiessen at a Paris Review Revel, is engaging and funny. But after 30 minutes I am only about 16 pages in, and Esmee has finished studying for Earth Science and needs the book. So they rolled up their sleeves and wrote their own textbook, which reads exactly like every other textbook. “If you look again at Table 1,” begins the section on silicates, “you can see that the two most abundant elements in Earth’s crust are silicon and oxygen.” I spend the next five minutes looking for Table 1, which is 12 pages earlier in the book. Then come carbonates, oxides, the sulfates and sulfides, halides, and—I am asleep after about 20 minutes. When I wake up, I go out to find Esmee in the living room, where she is buried in Angela’s Ashes. I struggle with Earth Science for another half hour, attempting to memorize rather than understand, before I give up and decide I have to get my reading done. Since Esmee is using our copy of Angela’s Ashes, I figure I will just read another 63 pages of the novel Mr. Penumbra’s 24-Hour Bookstore, which I started yesterday. I don’t make it. I’m asleep for good after about 15 pages. Esmee stays up until a little after midnight to finish her reading. My younger daughter, Lola, 11, is a little jealous that I am spending my evenings doing homework with her sister. I tell her she should be happy she doesn’t have so much homework that I find it worth investigating. She agrees with this, but still makes me feel so guilty about it that I let her watch Pretty Little Liars, her favorite show. The co-op board meets—and over my objections makes me secretary—before I can start on Esmee’s homework. Tonight we have 12 more algebra equations, 45 more pages of Angela’s Ashes, and a Humanities project for which we have to write one to two pages in the style of The Absolutely True Diary of a Part-Time Indian, the young-adult novel by Sherman Alexie. There is also a Spanish test tomorrow on irregular verbs. The algebra is fast becoming my favorite part of this project. I may have picked an easy week, but something about combining like terms, inverting negative exponents, and then simplifying equations causes a tingle in a part of my brain that is usually dormant. Also, the work is finite: just 12 equations. She doesn’t know what the words mean. I spend a few minutes looking over the material, attempting to memorize the list of verbs and conjugations. Then it takes me about half an hour to memorize the three most common conjugation patterns. I decide to skip the irregular verbs. No. 6: Don’t Listen to Anything Your Father Says. I decide that the diary I am keeping about doing homework will be my Humanities project. Soon it’s 11 p.m., and I start bugging Esmee to go to bed. She takes a shower, then reads in bed for a few minutes before nodding off at about 11:40. I sneak in and grab her copy of Angela’s Ashes and catch up on my reading, getting all the way to page 120. The hardship of too much homework pales in comparison with the McCourt family’s travails. Still, because we are sharing our copy of Angela’s Ashes, I end up going to bed an hour after Esmee. One evening when Esmee was in sixth grade, I walked into her room at 1:30 a.m. to find her red-eyed, exhausted, and starting on her third hour of math. This was partially her fault, as she had let a couple of days’ worth of worksheets pile up, but it was also the nature of the work itself. One assignment had her calculating the area and perimeter of a series of shapes so complex that my wife, who trained as an architect in the Netherlands, spent half an hour on it before coming up with the right answers. The problem was not the complexity of the work, it was the amount of calculating required. The measurements included numbers like 78 13/64, and all this multiplying and dividing was to be done without a calculator. Another exercise required Esmee to find the distance from Sacramento—we were living in California—to every other state capital in America, in miles and kilometers. This last one caused me to question the value of the homework. That night, in an e-mail chain started by the class parent to seek chaperones for a field trip, I removed the teacher’s name, changed the subject line, and then asked the other parents in the class whether their children found the homework load onerous. After a few minutes, replies started coming in from parents along the lines of “Thank God, we thought we were the only ones,” “Our son has been up until 2 a.m. crying,” and so forth. Half the class’s parents responded that they thought too much homework was an issue. 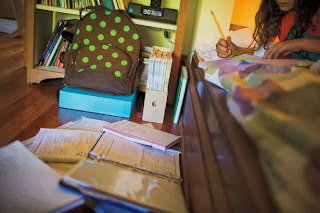 Since then, I’ve been wary of Esmee’s workload, and I’ve often suspected that teachers don’t have any idea about the cumulative amount of homework the kids are assigned when they are taking five classes. There is little to no coordination among teachers in most schools when it comes to assignments and test dates. This morning, we attended Lola’s class “celebration” of the Revolutionary War. The class had prepared dioramas of the role women played in the Revolution, the Boston Massacre, the Battle of Yorktown, and other signal events of the period. In hand-drawn murals explaining the causes of the conflict, the main theme was that excessive and unfair taxation had caused the colonies to rebel. The British had run up massive debts in the French and Indian War and wanted the colonists to repay them. I came home and took a nap. My older daughter’s homework load this evening is just seven algebra equations, studying for a Humanities test on industrialization, and more Earth Science. This algebra unit, on polynomials, seems to be a matter of remembering a few tricks. Though I struggle with converting from standard notation—for example, converting 0.00009621 to scientific notation is tricky (it’s 9.621 x 10¯5, which makes no intuitive sense to me)—it is pleasing that at some point I arrive at an answer, right or wrong, and my work is done and the teacher will give me credit for doing my homework. 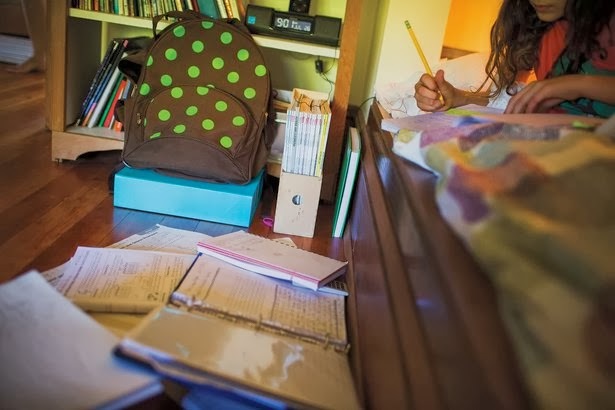 "My daughter has the misfortune of living through a period of peak homework. But it turns out that there is no correlation between homework and achievement." Earth Science is something else. I’ve been dreading returning to Tarbuck and Lutgens since our first meeting. And tonight, the chapter starts in the familiar dispiriting monotone. “Rocks are any solid mass of mineral or mineral-like matter occurring naturally as part of our planet.” But I am pleasantly surprised when T&L take a turn into the rock cycle, laying out the differences between igneous, sedimentary, and metamorphic rock in terms that are easy to understand and visualize. The accompanying charts are helpful, and as I keep reading into the chapter on igneous rocks, the differences between intrusive and extrusive igneous rocks make clear sense. The upcoming test in Humanities will focus on John D. Rockefeller, Andrew Carnegie, monopolies and trusts, laissez-faire capitalism, the Triangle Shirtwaist Factory fire, the foundation of labor unions, the imposition of factory safety standards, and the populist response to the grim conditions of the working man during the Industrial Revolution. My daughter has a study guide she is ready to print out. But our printer has just broken. We end up borrowing our neighbor’s printer. The logistics of picking up the printer, bringing it over to our apartment, downloading the software, and then printing take about half an hour. The study guide covers a wide range of topics, from how Rockefeller gained control of the oil industry, to the rise of monopolies and trusts, to the Sherman Antitrust Act, to the Triangle Shirtwaist fire. Esmee and I have a pretty long talk about the causes of the tragedy—the locked doors that prevented the young girls from taking breaks, stealing merchandise, or escaping the flames; the flammable waste material that had been allowed to accumulate—that leads to a discussion about trade unionism and then about capitalism in general. This is, I realize, a logical continuation of the conversation in my younger daughter’s class this morning, which started with unwieldy dioramas and implausible impersonations of King George. Freedom, in the form of unfettered capitalism, also has its downside. I tell her my view: laborers have to organize into unions, because otherwise those who control the capital have all the power. She falls asleep reading Angela’s Ashes. My daughter has the misfortune of living through a period of peak homework. The irony is that some countries where the school systems are held up as models for our schools have been going in the opposite direction of the U.S., giving less homework and implementing narrower curricula built to encourage deeper understanding rather than broader coverage. In the U.S., or at least in the schools my daughters have attended, there has been no sign of teachers’ letting up on homework. According to a University of Michigan study, the average time spent weekly on homework increased from two hours and 38 minutes in 1981 to three hours and 58 minutes in 2004. Data from a 2007 National Center for Education Statistics survey showed American students between grades nine and 12 doing an average of 6.8 hours of homework a week—which sounds pretty reasonable compared with what my daughter is assigned—and 42 percent of students saying they have homework five or more days a week. Esmee has hours of homework every night. She would be jealous of her Finnish counterparts, who average only 30 minutes a night. I’m not interested in No Child Left Behind. What I am interested in is what my daughter is doing between 8 o’clock and midnight, when she finally gets to bed. Attitudes toward homework swing in cycles of roughly 30 years, according to Harris Cooper, a professor of education at Duke University and the author of The Battle Over Homework. We went from piling on the homework because of fears of a science gap brought on by Sputnik in the late 1950s, to backing off in the Woodstock generation of the ’70s amid worries about overstressing kids, to the ’90s fears of falling behind East Asian students. Back in California, when I raised the issue of too much homework on that e‑mail chain, about half the parents were pleased that someone had brought this up, and many had already spoken to the math teacher about it. Others were eager to approach school officials. But at least one parent didn’t agree, and forwarded the whole exchange to the teacher in question. As the person who instigated the conversation, I was called in to the vice principal’s office and accused of cyber-bullying. I suggested that parents’ meeting to discuss their children’s education was generally a positive thing; we merely chose to have our meeting in cyberspace instead of the school cafeteria. He disagreed, saying the teacher felt threatened. And he added that students weren’t allowed to cyber bully, so parents should be held to the same standard. I explained that we never intended for the teacher to read those notes. This was a forum where we were airing our concerns. What was frustrating me was that the underlying issue of ridiculous amounts of busywork was getting buried beneath the supposed method we had used to discuss the issue. Even when I showed the vice principal examples of the homework assignments, he didn’t see them as outside the usual in terms of content or time commitment. I left believing I hadn’t solved the problem. Yet something did change. Over the next few months, the math teacher assigned a more manageable workload. My daughter now went to bed before 10 o’clock most nights. Parent-teacher conferences at the Lab School are similar to what I imagine speed dating to be like. Each conference is three minutes, and parents can attend an afternoon or evening session. My wife and I choose the afternoon. The conferences are strictly first come, first served. At noon, my wife and I sit in chairs outside each classroom waiting our turn, sometimes for as long as 45 minutes. A student is supposed to be timing each conference, but the students often wander off, and the teachers ignore the parents’ knocking after three minutes. In each conference, I urge the teachers to give less homework. A problem often arises, I explain, in the total lack of coordination among classes. A Humanities assignment requiring the kids to render in words, pictures, or both a scene from Angela’s Ashes, say, can take an hour or two, yet most teachers don’t seem to consider anything creative to be homework. The creative stuff, like drawing or writing a short story or preparing a scene from a play, is all extra, to be completed in addition to the hours of humanities, math, science, and Spanish. The teachers usually respond in one of two ways. They nod sympathetically and agree that the kids do have a lot of work, as if they have nothing to do with the assigning of it. Or they say that time management is one of the skills that a successful high-school student will need, and if my daughter wants to perform in an elite high school, she had better learn that in middle school. Both answers amount to essentially the same argument: the vast amounts of homework are somehow handed down from on high, and mere teachers can do nothing to tamper with the ordained quantities. Because I happen to be in the middle of my week of homework when this year’s parent-teacher conferences take place, I am uniquely equipped to discuss the work Esmee is doing. And over the years, I have noticed that the amount of homework does let up, slightly, after the conferences—if enough parents complain. However, there is always a clique of parents who are happy with the amount of homework. In fact, they would prefer more. I tend not to get along with that type of parent. At a meeting with Esmee’s Earth Science teacher, I find out that my daughter has in fact not been giving me all the work. There is a worksheet, for example, requiring a reinterpretation and annotation of the rock cycle that Esmee never handed over. The teacher finds an extra copy for me. So I have another date with Tarbuck and Lutgens. When I get home, Esmee tells me she got a C on her math homework from the night before because she hadn’t made an answer column. Her correct answers were there, at the end of each neatly written-out equation, yet they weren’t segregated into a separate column on the right side of each page. I’m amazed that the pettiness of this doesn’t seem to bother her. School is training her well for the inanities of adult life. Our math homework this evening is practicing multiplying a polynomial by a monomial, and we breeze through it in about half an hour. And, at last, more Angela’s Ashes. The more immersed I become in Esmee’s homework, the more reassured I am that the teachers, principals, and school-board members who are coming up with this curriculum are earnest about their work. They are making difficult decisions about what to teach or not teach in the limited class time they have. The overall education being imparted is secular, humanistic, multicultural, and intensely quantitative. The math Esmee is doing at 13, for example, is beyond what I was doing at that age. Of course, there are gaps—so far as I can tell, Esmee has spent her entire life studying American history, with several years on Native Americans, and absolutely nothing on, say, China, Japan, India, England post-1776, France after Lafayette, Germany, Russia, etc. Like many parents, I wish there was more emphasis on creative work, on writing assignments that didn’t require Esmee to use eight “transition words” and seven metaphors. This school has clearly made choices—these kids are going to get very good at algebra and maybe a little less good at creative writing. I can’t say I fault them in this, though I know what I would prefer to spend my days doing. If Esmee masters the material covered in her classes, she will emerge as a well-rounded, socially aware citizen, a serious reader with good reasoning capabilities and a decent knowledge of the universe she lives in. What more can I ask of her school? But are these many hours of homework the only way to achieve this metamorphosis of child into virtuous citizen? According to my daughter’s teachers, principals, and administrators, the answer is an emphatic yes. Certainly, they have told me, all the homework does no harm. As I watch my daughter struggle through school days on too little sleep and feel almost guilty if she wants to watch an hour of television instead of advancing a few yards in the trench warfare of her weekly homework routine, I have my doubts. When would she ever have time to, say, read a book for pleasure? Or write a story or paint a picture or play the guitar? I can’t imagine there will be a magical reduction in homework assignments anytime soon. But what I will continue to do at every opportunity is remind teachers that if each is assigning an hour of homework a night, and the average kid is taking four or five academic classes, then that is simply an unrealistic cumulative workload. Give the kids a break. Once in a while. I don’t expect teachers to drastically curtail their assignments, just to occasionally lighten the load. Of course, I may just be balancing the scales against those parents asking for extra assignments for their child. Has this worked? Well, it did in Brentwood, even if it took parental pressure. And though I can’t draw a causal line between my day of speed dating—I mean, going to parent-teacher conferences—at the Lab School and a reduction in homework assignments, it did seem to me that in the months afterward, Esmee was able to get more sleep. At least a couple of minutes’ worth. Esmee just started high school. She has told me she feels that the many hours of homework in middle school have prepared her well. “There is no way they can give me more homework,” she reasons. As for Lola: When it came time to select a middle school, she took the admissions test for Lab and listed it as her first choice, despite my telling her that in my view, the school is too rigidly focused on academics and assigns too much homework. Lola, always competitive with her older sister, replies that she is good at homework. She’s going to need to be. She was accepted at Lab. Lola is sleeping over at a friend’s house. Esmee hasn’t started her weekend homework yet. Instead, she’s watching episodes of Portlandia on her computer. The weekend homework includes another 15 algebra equations, studying for a Spanish test on Monday, and, of course, more Angela’s Ashes. She also has an algebra midterm on Tuesday. I tell Esmee that this seems strange—didn’t she just have an algebra midterm? She says that in her class, they have more than one midterm every term. My wife and I decide to go out to dinner, and on our way up Hudson Street, we run into another couple we are close friends with. This couple’s oldest daughter also goes to Lab. She’s at home doing homework. We stand on the sidewalk for a few minutes, chatting. The husband is smoking a joint, and he hands it over. I haven’t smoked in a few months, but it’s Friday night and I’ve been doing homework all week. I take a few tokes. We part ways, and my wife and I go to a Japanese restaurant, where, as soon as I am seated, I regret smoking. It’s going to be hell trying to do algebra tonight with the head I have on right now. Nonetheless, when I’m home, I sit at the dining table and attempt to work my way through the polynomial worksheet. I am immediately lost in all the 2x(–3y5+ 3x2)6s. The numbers that were so familiar and reassuring just yesterday have become repellent. I realize, sitting there, failing to solve my algebra homework, that I have inadvertently yet perfectly re-created my own eighth-grade homework conditions: getting stoned, attempting math, and failing at it. I consider my daughter, who to my knowledge has never smoked marijuana. That’s a good thing, I think in my hazy state. I wouldn’t wish this condition—attempting algebra when high—on anyone. One of the reasons I believe my daughter hasn’t yet tried marijuana is because she simply doesn’t have the time. I decide to give up on algebra for the night. It’s only Friday, and I have until Monday to finish my homework. Karl Taro Greenfeld’s most recent book is the novel Triburbia.